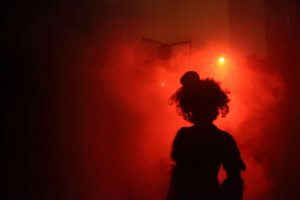 For the past few years, we’ve been “a little critical” of Knott’s Scary Farm, which seemed to be falling behind as newer and more innovative haunts have populated the Southern California area. 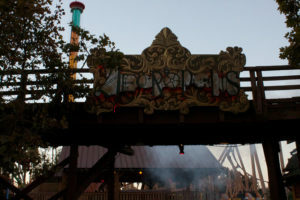 However, this year, there’s no mistaking that the venerable Haunt is back and ready to prove that there’s still more to fear inside the Scary Farm. 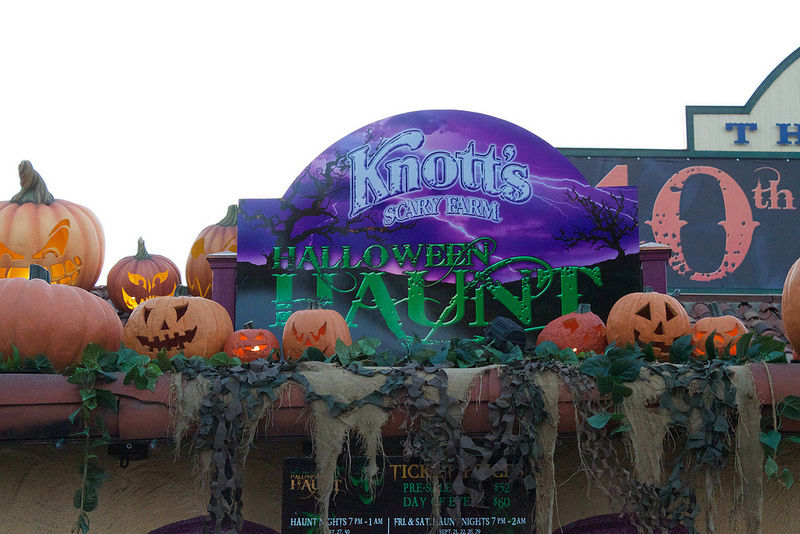 We won’t call it a comeback because they’ve been haunting for 40 years, but this year Knott’s Scary Farm presents one of the most fun, nostalgic, and most importantly, scary Halloween Haunts we’ve experienced there in years. In addition to being Knott’s 40th, this year marked the 20th anniversary of when the Scare Zone crew started haunt stalking together, and Knott’s was the first haunt we went to, beginning our obsession. So, on this trip, we went with a sense of nostalgia, reminiscing about mazes such as Uncle Ernie’s Madhouse, Lair of the Vampire, Terror Mountain, Toxichem, and Mother Noose’s Scary Tales, all of which frightened us and haunted our imaginations. Looking back to 1992, admission cost us $28, they had 8 mazes and attractions, Elvira was headlining her own show (“Red, White, and Boo Revue”), and Haunt ran for “only” 11 nights. Now, 20 years later, admission “only” cost us $36 (Sunday night early in the season), they have 13 mazes, 3 scare zones, and Magician Ed Alonzo is the headliner. 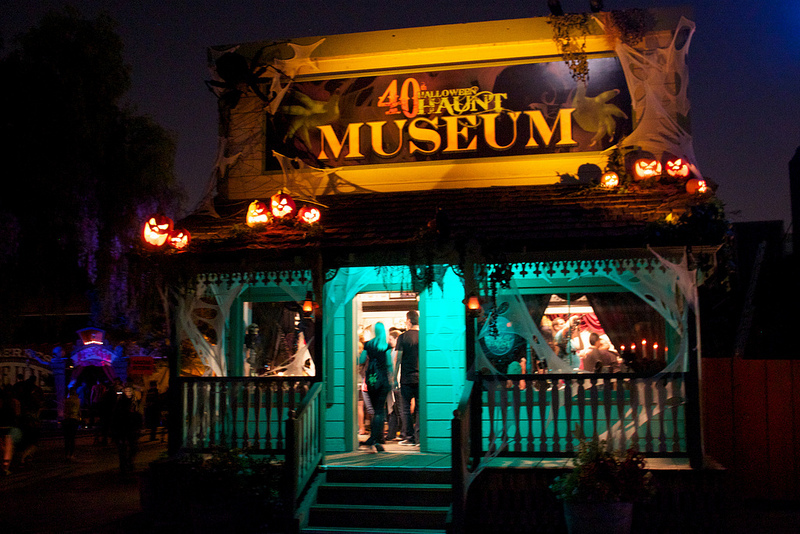 To further help us reminisce, this year also features the 40th haunt Museum which offers a satisfying tribute to Haunt for the fans. 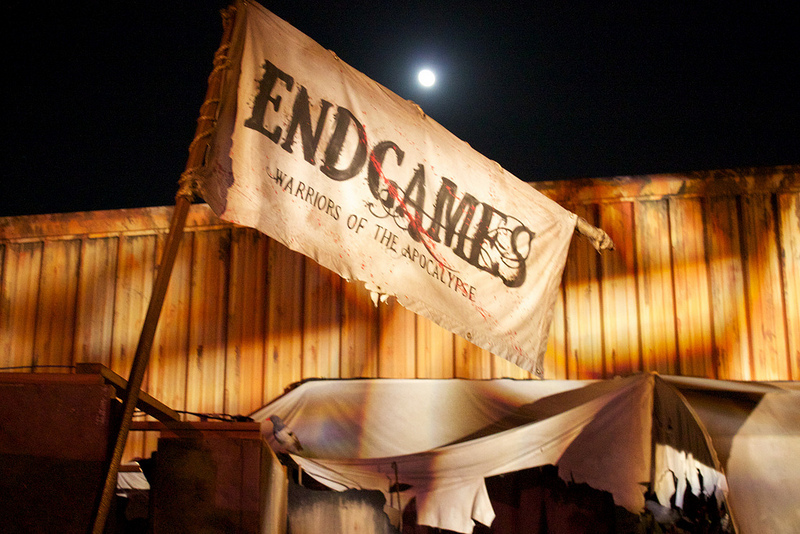 Inside, there’s pictures and memorabilia highlighting some of haunt’s most memorable and scare-breaking moments. We were lucky enough to stop in during a signing by Ted Dougherty of his new book, Knott’s Scary Farm Halloween Haunt: A Picture History. As a side note, this book is must have for all Haunt Fans as it includes accounts and pictures from all the mazes, monsters and shows from Scary Farm’s 40 years. Another cool addition for 2012 is an opening “scare-amony” featuring the Green Witch just outside the Haunt front gates. Because we followed our terror tips and arrived early, we were there to see the Green Witch rise up out of the fog and curse us all before the gates opened. 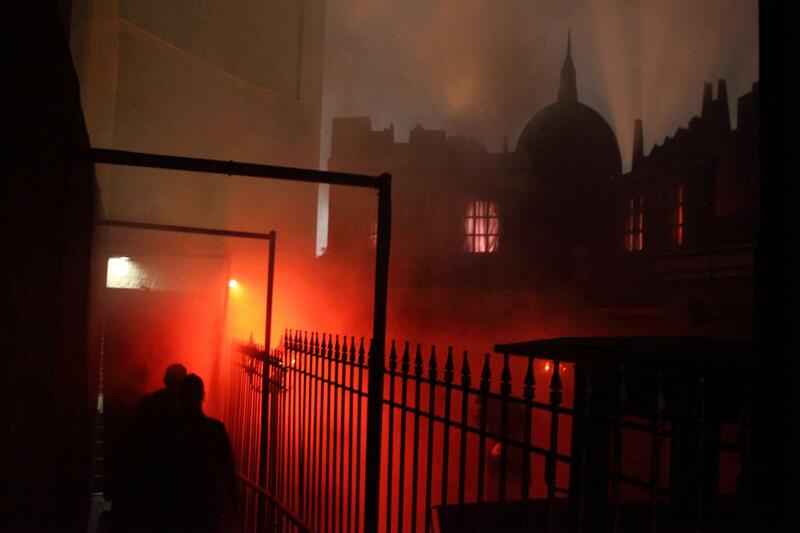 It was really cool and prepared us for the new “theatrical” tone Haunt has adopted this year. 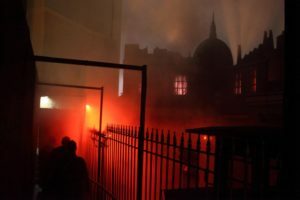 We do our best not to spoil the mazes for those who’ve yet to experience them, so we won’t provide scare-by-scare reviews, but we will share highlights and our overall opinions from our own experiences in the mazes. It’s strange when you think about it, but mazes themed to the actual holiday of Halloween are pretty rare. So we were very excited when the theme of this maze was revealed earlier this summer. And it did not disappoint: This maze was chock full of Halloween spirit. The maze begins at the front door of the Green Witch’s house, where we were told to ring the doorbell and yell “Trick or Treat!” The door opens, and the Green Witch is there to greet us. Jack-O-Lanterns line the staircase, and the front rooms have special ghostly effects. The maze has a “haunted mansion” feel to it, and the Tricksters show up in various rooms along the way. You may recognize many of the sets from 13 Axe Murder Manor, but they fit in very well with the new theme. This maze was much more theatrical than any other maze at Haunt. The Green Witch is a true character, and the Tricksters stop you in the end scene so you can be cursed by the Witch herself. Overall, the scares were a little weak, but we loved the atmosphere and story line. 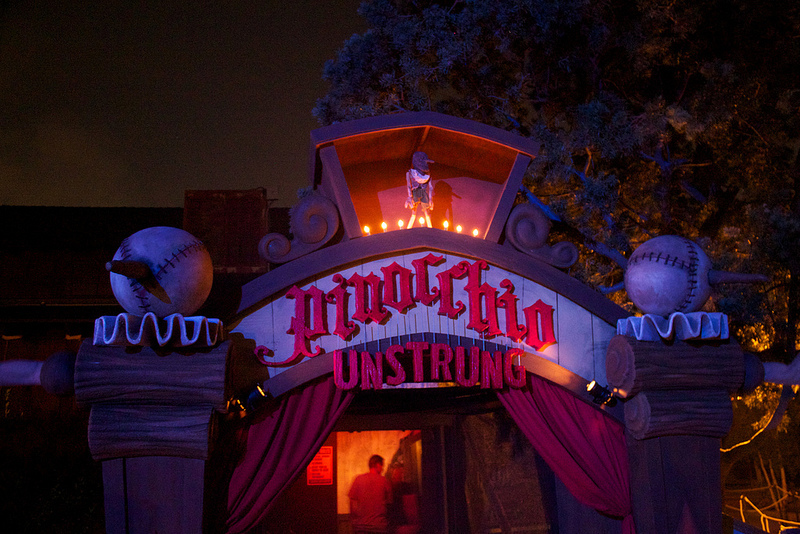 He has no strings to hold him down, so you better watch out… This maze is on a new level for Knott’s Scary Farm. This is the kind of maze we’ve been screaming for, no lie! It has beautifully detailed sets, a full and understandable story line, and some new scare tactics. Past haunters will notice that the layout is the same as the former Doll Factory and there’s the similar scene of marionette girls moving in an disjointed fashion; however, the rest of the maze is an entirely new experience. The entire setting feels like walking through a bloody, after hours, version of Disneyland’s Pinocchio ride. Just as Mother Noose’s Scary Tales did 20 years ago, Pinocchio successfully twists the popular children’s story in a way that makes its feel as if we were trapped inside a dark storybook nightmare. What’s unsettling about the maze is how the once innocent characters are now placed into scenes of distress, gore, and horror. It’s rather tragic to see Gepetto, Stromboli, and the Blue Fairy meet their fates at the hands of a torturous wooden puppet who instead of becoming a real boy now wants to be a real killer. This maze is not to be missed. 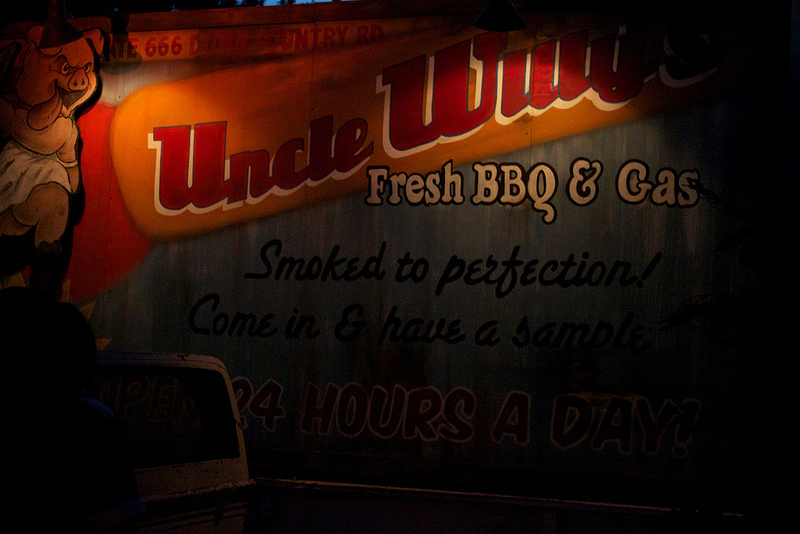 We think it’s an instant Haunt classic. You really should go through it at least twice, in order to be able to fully take in all the scenes and first-class set and prop designs. We look forward to being terrorized by Pinocchio in the years to come. After the demise of Club Blood and a brief respite from vampire mazes, Knott’s has brought back this “beloved” maze from the 90s. Unfortunately, we have fonder memories of 1992’s Lair of the Vampire. This maze has nothing fresh to offer, and the concept is as dead and tired as the fiddle-playing vampires lazily wandering around the halls inside. This maze has all the old cliches about vampires: frilly shirts with ruffles, dying flowers in fancy vases, decadent furniture covered in velvet, paintings of vampires lying around on said furniture, etc., etc. The vampires stand around playing string instruments that are partly composed of human body parts. Before Haunt opened, we kept hearing how “detailed” this maze was going to be. However, it did not live up to this hype. Many of the walls were bare, with only a couple of vampire paintings thrown on for scenery. If you’re a 12-year-old who loves Anne Rice novels or Twilight, this maze is probably for you. For the rest of us, it’s a boring trek through scenes we’ve experienced countless times in other vampire mazes. Twenty years ago, the Timber Mountain Log ride was transformed into Terror Mountain. The mountain was filled with monsters and scenes of carnage throughout. It was a very scary ride as riders felt vulnerable sitting the the open logs with monsters attacking from every direction. In recent years, the log ride hasn’t been nearly as scary. You could count all of the monsters on one hand, and the haunt props were scarce. 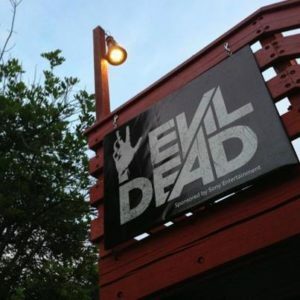 Early in the year, we had heard that the ride wasn’t getting a haunt layover; however, at the end of the summer, there was a surprise announcement that it was being themed as The Evil Dead for haunt. We were excited to see the Evil Dead being featured at Knott’s, and believed the log ride was the perfect setting for this theme. To our disappointment, this ride ended up not featuring much in terms of a haunt layover. There was a slight increase in the number of monsters and a few new props such as the infamous “Book of the Dead.” But it’s obvious that the CAL-OSHA crackdown on monsters being stationed along the flume and management’s push to keep haunt from interfering with the experience of day-time guests have taken their toll. Outside of the soundtrack and a few nods to some iconic scenes in the movie, the ride really could of been any haunted cabin in the woods type of theme. It also didn’t have any kind of consistent story line as they just made the scenes fit wherever they could along the flume and in the mountain. 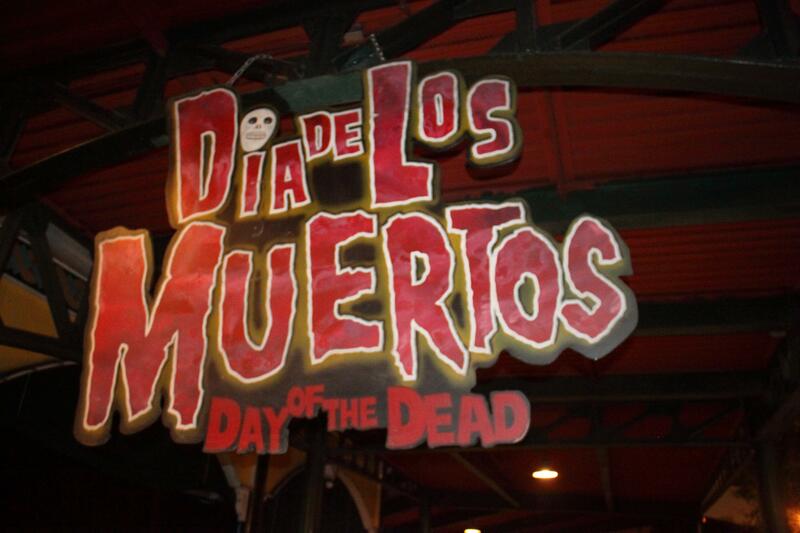 Furthermore, we were a little disappointed that this ride wasn’t really based on the classic Evil Dead movies. Instead, it promoted the upcoming 2013 remake. It really seems that this was a last-minute addition made to secure some sponsorship dollars. We still like think the log ride is a fun attraction–just don’t go on it expecting an intense or elaborate haunt experience We also recommend that you get on it early in the evening before the lines get too long. This was Knott’s first VIP/up-charge maze and a complete departure from their standard conga-line maze format. This maze costs $60 (for up to 6 people) and requires a reservation in advance. When we arrived at our reservation time, we were asked to read and sign a waiver. After we signed, we were ushered into a holding room, where we received more warnings from a personable hostess. We really didn’t know what to expect from this new “experience,” so we were a bit nervous. Of course, we’re not actually going to tell you what goes on inside; after all, if you’re going to pay $60, you should get the full experience and be surprised. We can tell you that you’ll have to solve puzzles to progress through the maze, and there will be some uncomfortable experiences along the way. The actors inside are much different from other actors in the regular mazes: they are playing actual speaking roles and do a great job of staying in character as they interact with you. They’re there to help you figure out what to do in order to move onto the next room. Some of the puzzles were harder to solve than others, but the whole experience ended up taking us only 15 minutes to get through. Unfortunately, we didn’t find it to be very scary, but it was a very fun experience. We wished it were just a tiny bit longer–maybe just 2 more rooms would’ve made the $60 seem a bit more of a value. Nevertheless, we applaud their innovation with this concept and really hope they bring this back next year. Back for its second year, Delirium is an indirect sequel to the past Asylum mazes, where now we’re going inside the mind of one of the demented patients. The entrance is amazingly elaborate where we have to enter the “mouth of madness” and then pass through the stomach of the bloody beast. This opening scene features enlarged animated eyes, teeth and claws reaching for you, and it really draws you into Delirium’s nightmarish dimensions. Once inside, we encountered many disturbing scenes, which included people spewing cockroaches, monstrously large flesh-eating maggots, and hideously bloody monsters hiding under the beds. This maze also featured some of most interesting lighting effects and props. 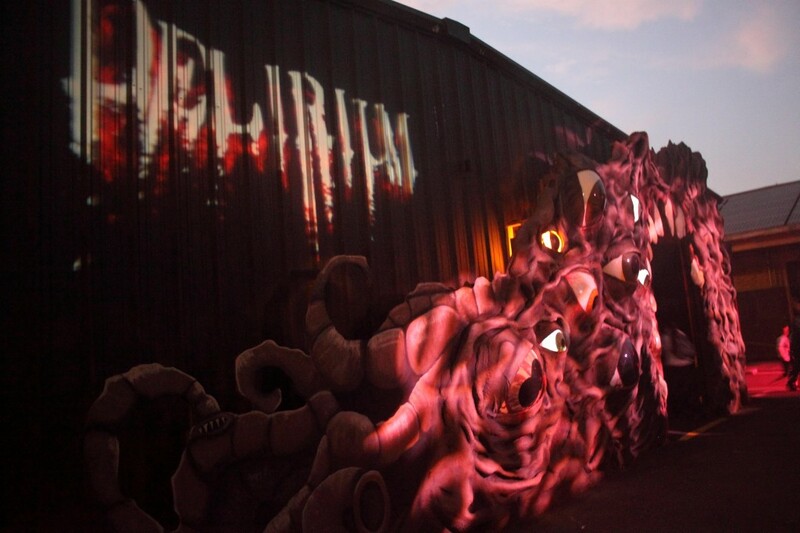 Delirium was once again one of the better mazes at Haunt. We love the nightmare/dementia theme that gets progressively more twisted as the maze progresses. This one will likely be around for a few more years, so we hope they can change up or add a few more scenes next year. This maze has a good mix of monsters who are there to scare and those who’s presence is simply to add to the eerie atmosphere. Our favorite moment was in the outdoor graveyard where we encountered a surprisingly new and loud scare. We liked the extended brothel and sewer scenes. And per our review last year, we like that in the final scene they switched out the Dr. Frankenstein laboratory for a dark and bloody torture chamber, which better fits with the proceeding scenes. We believe that maze may have a couple more years of “death” left in it at KSF. Last year, our review of Slaughterhouse had this advice: “If Knott’s decides to continue Farmer Willy’s mayhem, which they probably will, they should redesign the layout, improve the lighting effects and props, and bring in more real-life victims.” This year, Knott’s has completely fulfilled all our requests. This maze was totally redesigned, and even though it’s shorter than before, we feel that it’s a vast improvement on an old theme. The maze has a much darker tone, and although the opening scene in the diner is a bit comical, the laughs end there. Inside the “Slaughterhouse” portion of the maze, the sets and actors are much more menacing than in previous years, and the monsters were able to scare us many times. Overall, this maze was one of the highlights of our night as it reminded us of another Scary Farm uncle named Ernie, who terrorized us 20 years ago. This maze has been changed a bit this year, although the changes are not very major. They did add some street scenes with a more enclosed feeling, but unfortunately the monsters (and hence scares) were once again absent. For most fans, this is one of the least favorite mazes of Haunt, and nothing much has improved in 2012. The colors and 3D effects are interesting, and there are also some very cool looking scenes, like the church, graveyard, Amazon jungle, and Aztec sacrifice temple. However, there’s just something about this maze that prevents the monsters from ever really scaring anyone. 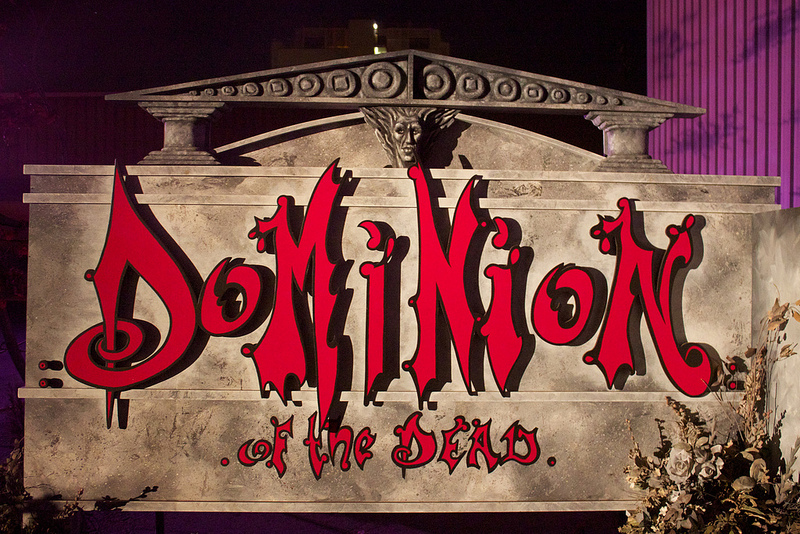 We hope the Dead can rest next year and something new can take the place of this maze. 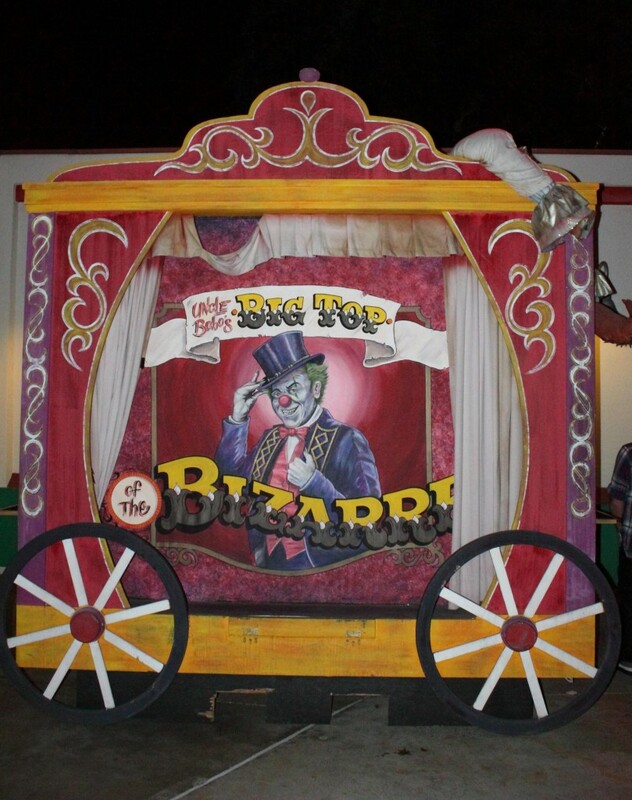 It’s time for Uncle Bobo to pack up his Big Top and move onto the next town! This maze has worn out its welcome. There have been a few changes since last year, but nothing worth writing about. As the years go on, Uncle Bobo’s has become almost entirely overtaken by toilet humor. We didn’t think they could put MORE flatulence and excrement into this maze, but it appears they have. It seems the clowns have completely given up on attempting to scare anyone and now merely shake their asses in sync with the farting soundtrack all night. Please, Knott’s, we beg you to flush this one! When this maze debuted in 2010, it was notable for its more elaborate sets and the sense of place it created. The maze had a coherent story, and it lacked the black walls and empty spaces that filled some of Knott’s other mazes. Creating more detailed and interesting mazes has been Knott’s new direction for the past few years (most likely in response to competition from Halloween Horror Nights), and we love to see them taking that route. And that is why we were completely baffled by the half-assed tie-in with the Carrie remake they tacked on at the very end of this maze. We have no idea why or how Carrie White has come to be in a town infected with a zombie-creating virus in the 1960s. They did attempt to expand the school scenes to perhaps create more of a flow with the Carrie story, but it just doesn’t work. It’s so obviously a marketing gimmick–and for that reason it distracts from an otherwise interesting maze. Whoever came up with this lame promotional deal should have a bucket of pig’s blood dumped on his head. This maze bares some resemblance to the 1992 Toxichem maze, which featured radiated and toxic mutant monsters. There was a slight improvement to this maze over last year’s version. Once again, we were the only ones inside, so we received the monsters’ full attention. This maze does have some extraordinary animatronic props, and it’s very claustrophobic in sections. The problem with Fallout Shelter is that the story isn’t coherent and the theme is hard to get. In addition, it’s considered a 3D maze, but the 3D effects are minimal, so it’s hard to tell if there was anything that was really supposed to be in 3D. If anything, the 3D glasses merely cause a sense of disorientation, which makes everything a bit fuzzy and actually does contribute to the fear. 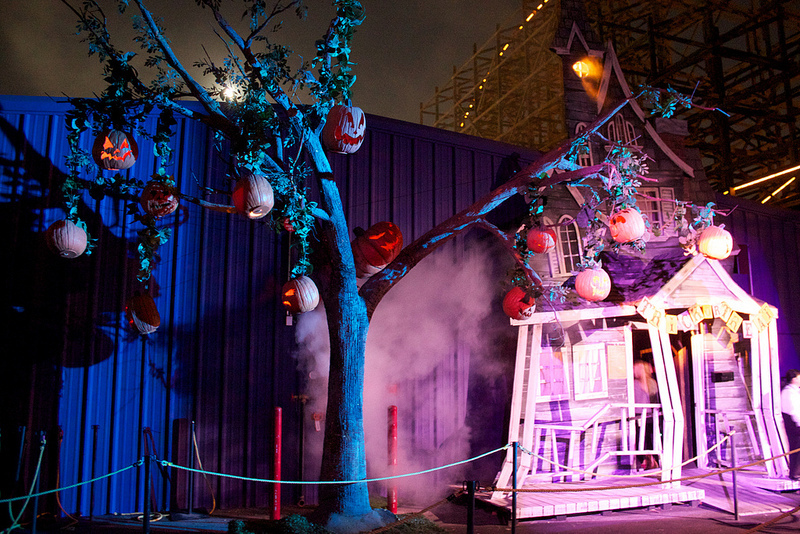 But if this maze does return next year, we’d like to see some more props and a bit more 3D effects. A new maze for 2011, Endgames was inspired (loosely) by the Hunger Games book series. Most of the maze has a standard post-apocalyptic, industrial feel with a bit of gore mixed in, but the twist to this maze is the addition of video screens throughout. The screens show live feeds of people walking through other parts of the mazes, which would be a great way to heighten the suspense…if those other people were getting scared. Crowds were light on the night we attended, so there wasn’t much action on the video screens. The feed is also streamed live on the Internet, but the live feed is filled with commercials, so if you have friends watching for you in the maze, they might miss you. But we do appreciate the addition of the interactive video effect. We see some potential in this maze as the years progress. Overall, we didn’t find it to be too scary, but the sets were pretty detailed and interesting. 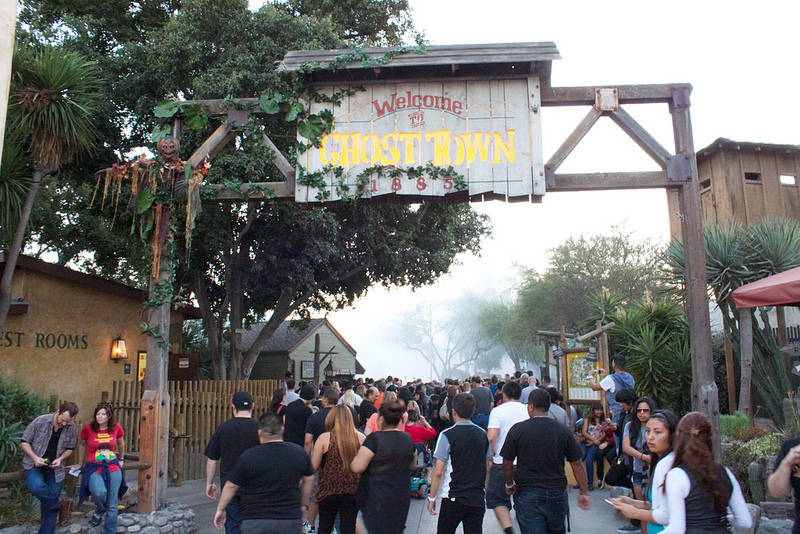 Ghost Town: This is a Knott’s classic, and after 20 years, walking through the fog-filled streets doesn’t stop being a nerve-wracking good time! Carnevil: Some disturbing antics from the Crazy Killer Clowns who are on the loose in the streets. These guys are fun and not very scary, but they are engaging with guests and full of pranks. These are also some of the biggest hams and will eagerly pose for your pictures. 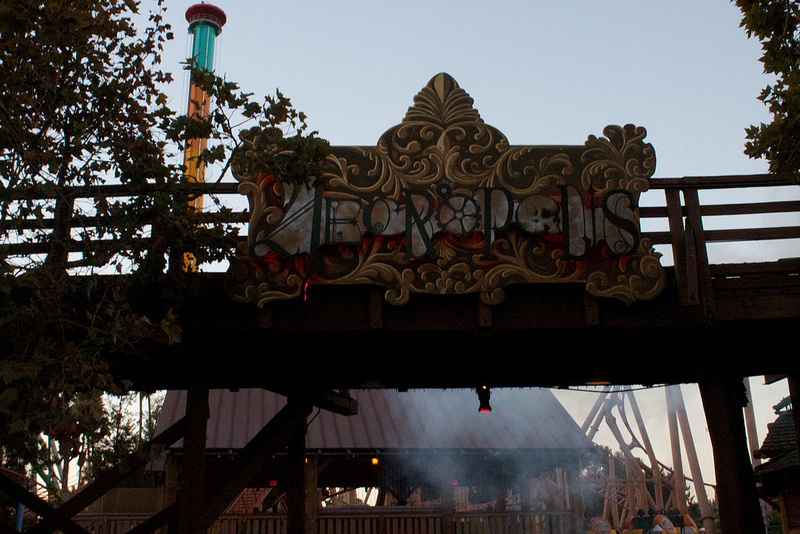 The Necropols: This is scare zone features Victorian Steampunk vampires in the most elaborate costumes of all the scare zones. Due to changes in Knott’s haunt operating policies the settings in this area were more sparse but the the monsters were still aggressively scary. They were even scaring people who dared to look down to text or who were walking out of the bathrooms (then having to go back in). Calico Mine Train – Curse of the Green Witch: This isn’t a scare zone, and it’s not a maze/attraction…we don’t really know where to classify this one. It didn’t even make it onto the park map this year, and we heard that there were no effects in the ride on opening weekend. 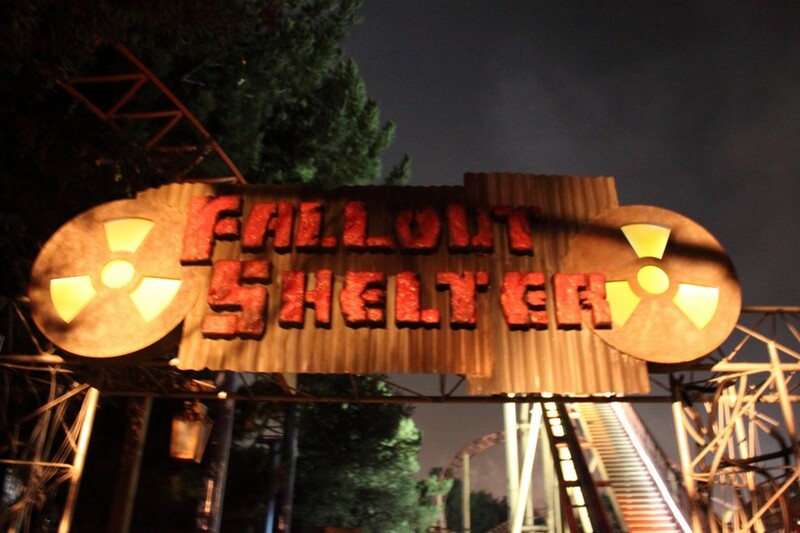 However, we were glad to see that they have added a few Haunt elements to this attraction. Similar to the log ride, recent regulations from CAL-OSHA have now prevented actors from working in this attraction, so everything inside is just props or special effects. As you proceed through the ride, the driver of the mine cart tells the story of how the Green Witch was exiled from the town of Timber Mountain and took up residence inside the mine, where she cast her spell over the miners to do her bidding. The animatronic miners wear strange masks (e.g., a bunny mask, a bird mask), and there are a couple of Green Witch and skeleton props as well. The open cavern scene includes the return of the spinning ghosts and a pretty cool shadow effect of the Green Witch. While it’s sad that the Calico Mine Train, which housed some of the scariest mazes in years long past, will no longer be able to contain live actors, we’re glad that Knott’s still did something with this ride. And the story tie-in with the Green Witch was actually pretty cool. We recommend checking this out if the line is short. 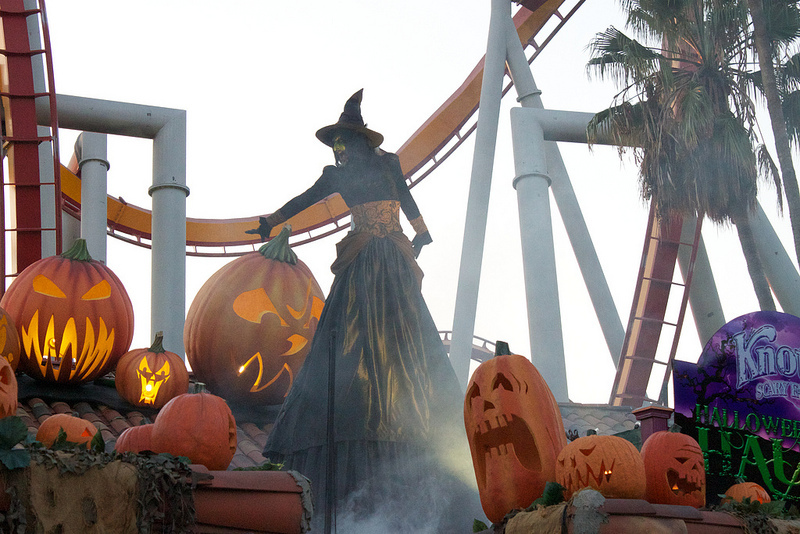 There’s no question that Knott’s is still the “worlds largest and scariest Halloween party.” What differentiates Knott’s from Universal is that it creates a complete feeling of Halloween throughout the park. 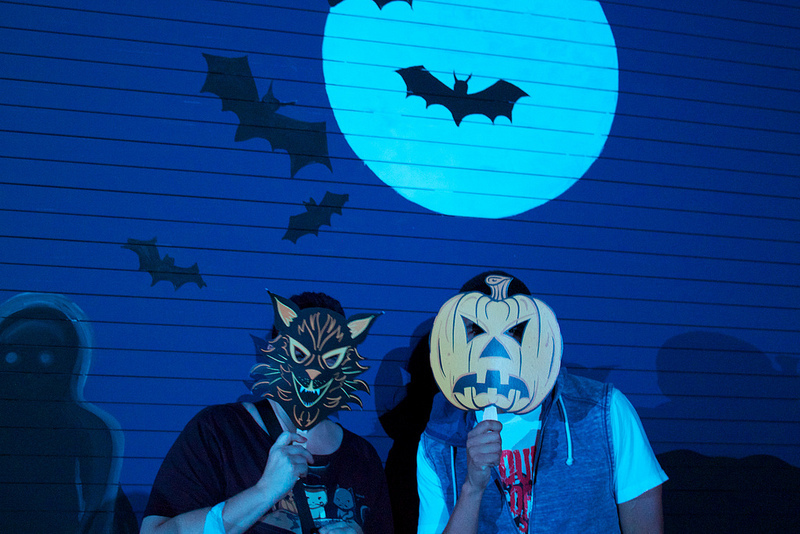 Where else can you actually get a mask and go trick or treating inside the haunt? 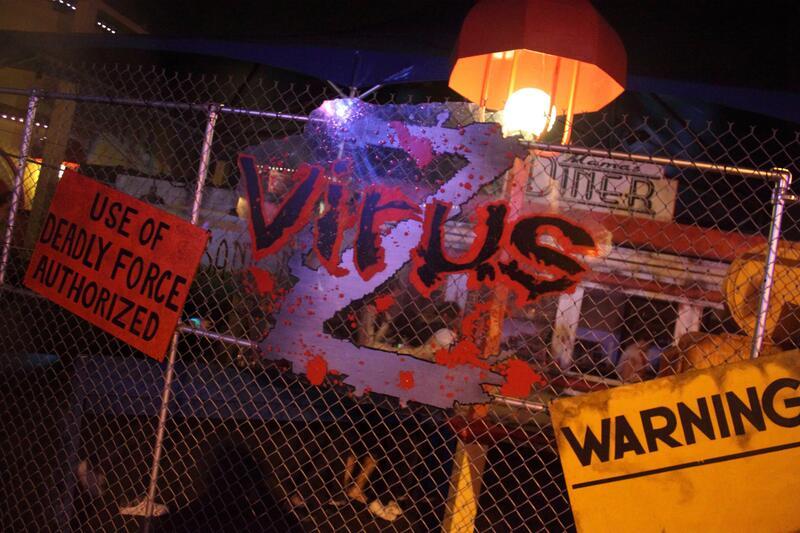 They also offer the most variety of themes, shows, and attractions, where you’ll find everything from traditional Halloween ghouls to modern-day, adrenaline-pumping blood and gore, and everything in between. This year, we may have been more nostalgic, but we can honestly say that we found the mazes to be scarier and more elaborate. 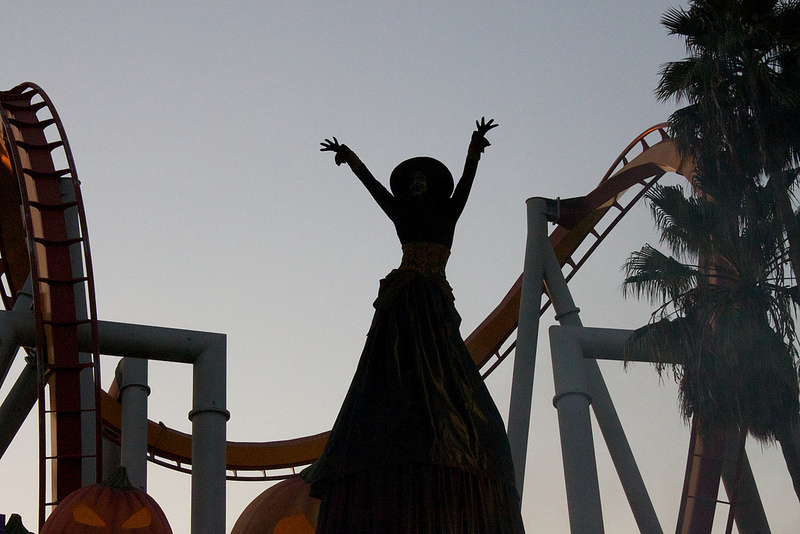 There’s still some improvements that can be made, but Knott’s Scary Farm really is a cultural phenomenon, and we’re glad to see it coming back with a vengeance to retain its crown as the granddaddy of all haunts. There’s no longer a question that they’ll continue to reign over Halloween for 40 more years and beyond.